Here are three of the latest posts on Gaia Portal by ÉirePort that I’ve missed. A couple more will follow, to catch me up with the latest. They are indicating the lead-up to the end of the First Wave of Ascension and The Event. My comments are in orange. Please add your own in the comment section—or just reply to the emailed post and the reply will automatically be posted as a comment. 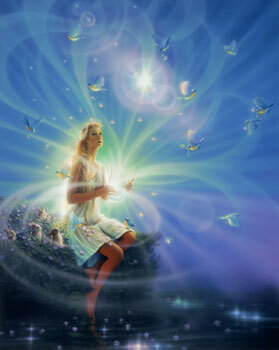 I take stellarization to mean to rise from the physical to the astral in substance, or vibrational quality. That means to rise from 3D to a higher level. That is, to ascend. This is the ending period of the First Wave of Ascension, where, according to Matt Kahn, one third of Earth humanity will have ascended to become what Gaia Portal calls Hue-manity, and I call 5D people. Consciousness openings are two things: configurations of energy that facilitate higher levels of consciousness; and our actual increases in consciousness. That is, we are going 5D like crazy! People who already have increased consciousness, or ascended, to Hue-Being 5D level are affected more than the regular people. And their higher vibrations affect the regular people, giving them more opportunity to ascend to Hue-Beingness. Energetic forces affecting the planet have settled in, permanently anchored in place, continuing to affect 5D people and regular people. Forces such as those of the Resistance Movement, including extraterrestrials, are beginning to wrap up their missions and stay at base. People are having and remembering experiences in Higher Dimensions. People who are not incarnated on physical Earth, but live in higher spaces are encountering us in their dimensions. Paper shackles that enslaved us are broken, as we see them as such and realize that we have no need to agree to them. The Golden Age, or Sat Yuga, is a cyclic period of enlightened condition: peace, power, spiritual understanding, love, all things good. Theosophy teaches about the Yuga cycles of Earth timelines. As we ascend to being 5D people, all the psychological shackles are washed away. We love each other. Our consciousness expands into knowing who and how powerful we are as spirit. We slowly regain our Akashic memories and no longer fear nor desire harm to others. We powerful, compassionate Hue-Beings create the Golden Age. Overcoming chaotic circumstances and energetic conflicts that hold us back, our personal and collective energies settle into harmonious configurations. As we flare up out of dark unconsciousness, we facets of Source (God) demonstrate the flair of our true, one of a kind, brilliance. We take note of lower vibrations within ourselves (emotional issues, for example) and of society. They are all exposed for what they are, so they can be released. To me, True Counsel is the guidance of our Higher Selves and counsel of Angels, Ascended Masters, or groups of counsel (Council of Twelve, Council of Twenty-Four, etc.) on higher dimensions. That counsel is intuited and often channeled. We are learning to hold deep respect for such counsel, feeling it to be holy. We are more free to express our true selves. Our Higher Selves, our I AM, our godliness, shines out of us, though we are still incarnated. This is what Jesus demonstrated for us. Galactics—ET, that is—have been more and more openly appearing to us. They also communicate to us through intuitive channels. People are awakening to their relationships with the ET. People who came to Earth directly from other planets become aware of that fact. Those who don’t loose themselves from the old ways of belief in lack, continue to feel lack. Any system that is not in the light of truth, which stays with the limitations of 3D fallacious believing, thinking and acting, will fall away, one way or another. Negative, low energies can no longer exist in New Earth. Those who bring balance with female (Goddess) energies are the Artemists. They smudge away negativity and bring healing to Earth, as Artemist herbs do. The sweet Goddess creativity affects all of us. New systems of philosophy, education, healing, food growing, transportation, communication, self-governance, power engineering and science emerge. The old competative and restrictive forces of society are gone, inspiring and allowing engineers and artisans to flourish. But that is from a 3D perspective, looking to the future, thinking of what we now do. Our 5D abilities will include things we can’t now imagine. It is now safe to pursue creative endeavors that up to now would have been stopped, one way or another, by the powers that were. Flourishing of our positive intentions is now assured in New Earth. I think I actually awakened 10 years ago in my Mania. I wasn’t mature enough to handle it at the time. You see energy has increasingly been sent to our planet of the centuries. Those who are sensitive to the energy awaken in a half way. They have the ability to see what is and isn’t seen by others, but they react often in fear and confusion. This is why mental illness has really been increasing over the centuries, the increase in energy designed to wake up humanity. Without knowing it Big Plasma created a kind of weight. Old or sensitive Souls can fly up to Heaven in Mania or Psychosis without knowing what is happening. They see the unseen, but they fear. It is more new information then their brain can process at least they couldn’t in the past. It is to the point that it damages the living tissues of the brain. It is a visit to Hell on Earth for some. A joy ride for others. Yet, before the crystalline D.N.A. converts, the human body cannot handle that high frequency. Thought becomes broken. The brain processes thoughts at speeds it wasn’t designed for. Yet, as the crystalline converts the brain can handle more. It can process the higher thoughts faster, and efficiently. To me accession sounds like a calm Mania. One that does no damage, and in which thoughts are clear. Yet, you can suddenly connect more dots with your brain. You can create beautiful poetry, and art. You can access the higher dimensions in complete control. They did not really mean bad, ‘Big Plasma.’ They ask too much money, but they are not trying to hurt the mentally ill. With the help of their guides they created a way to keep people very grounded to the Earth. In fact, especially at first, they kept people too grounded to the point of depression. Yet, overtime they have come to get the balance better. My theory was, if God didn’t want people to have the option of medication, he would make it so no medication worked. It is contrary, however, Source wants people to stay on Earth while they are on Earth. Some medications are specially designed to help with ascension symptoms if they become too much. This was planned a long time. Nothing is up to chance, even Big Plasma is included. All is working out fine, whether or not a person is on any medication. They will still be able to ascend.